Once upon a time, a lovely young woman named Holly got engaged. With visions of splendid ideas dancing in her head, Holly enlisted her beloved sister Jen who―what luck!―was a planner by nature. As the Big Day got a bit closer, however, they realized if Jen were to enjoy the wedding too, she shouldn’t be scampering around watching over logistics and details. Jen should be having the time of her life, just like Holly! So Holly invited her dear friend and boss, Kaitlin, to step in. Perfect! Because Kaitlin owns two successful restaurants and is an amazing event planner. And then it happened―Jen and Kaitlin met. Stars aligned! It was shared love for wedding planning at first sight. They’d both always dreamed of having their own boutique company so they seized the opportunity. And that’s how, very quickly afterwards, Blue Lane Events was born. Certainly not the usual love child to come forth after a super fun wedding but absolutely welcomed with joy by all. As Blue Lane Events has grown over the years, Jen and Kaitlin have enthusiastically upleveled their professional talents. Both are certified wedding planners, attend educational conferences and embrace creative innovation to better serve their clients. 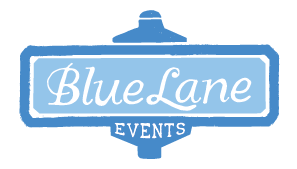 Blue Lane Events has also won the hearts of many very happy, very thankful brides and grooms. And parents too, who, having been spared the brunt of wedding day worry, actually retain delightful memories of this most precious occasion in their child’s life rather than a hazy blur of stress, photographer’s flashes and post-wedding exhaustion. And―what fun! Brides from across the country call on Blue Lane Events for help with their New England-based weddings, while New England brides reach out for their near and far, anywhere in the world destinations. They love, love, love how Jen and Kaitlin make everything about their wedding infinitely more creative, relaxing and beautiful. We’re yours for the asking! Simply give us a ring at 860.415.6338 or email Info@BlueLaneEvents.com today. With great kindness, powerful organization skills and a healthy dose of perfectionism, Kaitlin Baker-Hewes helps brides bring their dream wedding to life. What’s more, she’s absolutely there for them! Brides can relax and let go of their worries. They relish the fun of planning every juicy nuance and detail, knowing Kaitlin cares as much as they do about their wedding and that she’s easing every step leading up to their amazing day. Kaitlin also loves how the brides and grooms she partners with see their wedding as so much more than their moment of glory! It’s a tribute to how much they cherish their loved ones, including those that’ve passed. And, from the bottom of her heart, Kaitlin is overjoyed to help couples unite their friends and families while creating the celebration of a lifetime. Born and raised in New England, Kaitlin’s style and design philosophy reflect her rustic coastal upbringing. A certified wedding planner, she also infuses the excitement and diversity of the many cities she’s lived in and more than forty countries she’s traveled to. Plus, as owner-operator of two successful restaurants in Southeastern Connecticut, Kaitlin brings years of invaluable restaurant management, creative prowess and industry expertise to Blue Lane Events. Squeezed between her foreign excursions, Kaitlin earned her bachelor’s and two master’s degrees in Human Development & Family Studies, Psychology, and Child Development. She even found time for love(!) and married her husband, Sean, in 2007. Together, they adore adventuring near and far and celebrating milestones big and small with their own beloved extended family. That way, when the big day arrives, brides wake up happy, relaxed and confident―ready to savor every exquisite moment. After all (and this is Jen’s favorite part), at the end of the day, it’s really all about the love of two people committing to a new life together, a wonderful new story, and sharing their joy with their dearest friends and family. Jen’s deep well of creativity, organization and easy-going composure were honed during her many years as an elementary school teacher in Southeastern Connecticut. She first fell in love with wedding planning back in 2013, when helping a dear friend shed the planning overwhelm, take back the fun and conjure up a gorgeous, personalized celebration she still loves talking about! Jen’s also devoted to keeping up with―and innovating―the very latest wedding trends, as well as tapping into her native New England background to unearth the most beautiful, enticing venues for her clients. A certified wedding planner, Jen has a master’s degree in education and lives in Connecticut and Martha’s Vineyard with her husband and two sons. When not cheering the boys on at their games, you’ll find Jen entertaining friends or with her family at the beach or on the water — whenever she’s not planning the next big Blue Lane event!